Two students have bagged paid internships after a project which saw a weekly newspaper’s staff produce an edition from their college. 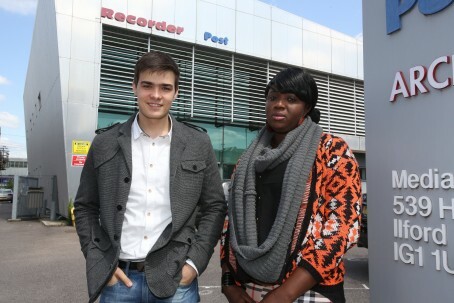 The Barking and Dagenham Post has chosen Barking and Dagenham College students Jamilatu Sesay, 27, and Julius Razanascas, 18, to spend 10 weeks with the paper following its second student takeover project. The Create Your Future scheme saw the majority of staff from the Archant-owned title decamp from their usual office for a week in June to work with eight students at the college in creating an edition of the Post. News editor Janine Rasiah, reporters Anna Silverman and Mark Shales, editor Michael Adkins, photographer Ellie Hoskins and Archant Dialogue videographer James Hustler all worked from the campus as part of the project. It followed months of work mentoring students in every aspect of the business from editorial, commercial, videography and digital sessions. Work produced by the students included a double page spread by Jamilatu on female genital mutilation, which she was a victim of while living in Sierra Leone. A weekly newspaper has launched a live news blog on its website to update readers with breaking news, sport, weather, travel and entertainment. The Derbyshire Times has created its Your Derbyshire Live rolling news feed to update readers with information from across the area. It comes after 12 other Johnston Press titles launched live news blogs last month, using the ScribbleLive tool to allow news teams to instantly update website users. Titles involved in the initial launch included The Scotsman, Yorkshire Post, Blackpool Gazette, Peterborough Telegraph and The Star in Sheffield. The Derbyshire Times is urging its readers to get involved by tweeting using the hashtag #derbyslive to have their say or send in photos. The title will also pull together relevant content from other social media sites, such as Facebook, YouTube and Instagram. A student newspaper’s office is to remain open after a succesful petition received almost 2,000 signatures. The University of Sheffield’s Students’ Union had planned to downsize the operations of its fortnightly Forge Press publication. The move would have seen Forge’s base, which it shares with the union’s TV and radio stations, converted into office space for the organisation’s staff. Student journalists would instead have been housed in a smaller area of the union’s buildings, which editor Polly Winn branded a “ridiculous” decision in an interview with Sheffield daily The Star. However, a petition rallying against the proposal received 1,756 signatures and support from alumni leading to the union backtracking on its proposal. According to The Star, Forge Press has a projected readership of 15,000–20,000 and its reporters are regularly nominated for student media awards. A former executive at The Sun is leaving his role as board member of press regulator IPSO, reportedly because of his connection to the tabloid newspaper. Bill Newman was one of 12 people appointed to IPSO’s board in May last year and the move was criticised at the time by the families of those who died in the Hillsborough disaster because he was associated with The Sun’s coverage of it. He was managing editor of The Sun in 1989 and wrote a letter to the Hillsborough families, defending its stories. It has been reported that Bill was told by IPSO chairman Sir Alan Moses that they did not want him on the board and he should not apply for the renewal of his contract because of his connection with The Sun. IPSO has confirmed that Bill will leave the board when his one-year contract expires in September and it will then advertise for a replacement. Students from a university reported from a popular Welsh festival as part of a three-year journalism project which is coming to an end. 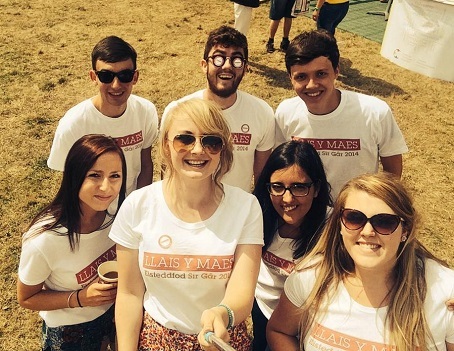 The Llais y Maes (Voice from the Field) bilingual digital newspaper was set up by Cardiff University’s Centre for Community Journalism in partnership with the National Eisteddfod of Wales, which ran from 1-8 August. Seven students took part in this year’s project, including Welsh speakers and international students, creating content for the Llais y Mais website. The digital title has been run by Emma Meese, manager of the Centre for Community Journalism, and journalism lecturer Sali Collins University, with the aim of giving students a real-world journalistic reporting challenge and to provide a fresh perspective on the festival. Said Emma: “This three-year partnership with the National Eisteddfod of Wales has built on this work and has been a fantastic opportunity for Cardiff University students to run their own digital newspaper, providing an alternative view of the festival. The team from last year’s project. Newsquest titles across the country are inviting charities to apply for grants from the foundation run by its US parent company. Grants of between £5,000 and £10,000 are on offer from the Gannett Foundation to groups which need cash to carry out projects in areas where it publishes newspapers and websites. The fund supports registered charities which take a creative approach to issues such as neighbourhood improvements, economic development, youth enterprise, assistance to disadvantaged or disabled people, care of the elderly, environmental conservation, and educational or cultural enrichment. Bradford’s Telegraph & Argus, one of the titles promoting the fund, said that last year, five good causes across its district shared almost £28,000 in Gannett Foundation grants. The deadline for applications is 16 October. Regional publisher Archant has agreed a deal with Sun and Times publisher News UK to distribute 14 of its London weeklies. The deal will see titles such as the Romford Recorder, Ham & High and Ilford Recorder be delivered via Newssolutions – News UK’s London retail distribution network. The portfolio of titles will be distributed to retailers within the M25 via Newssolutions from 31 August. Archant circulation director Darron McLoughlin said: “We are really pleased to agree a deal with Newssolutions for distribution of our paid-for titles to retailers in the London area.